I challenged myself to experience the active/non-active cleansing difference by checking out the new medical skincare brand, Dermaenergy. The Dermaenergy skincare range is 100% Australian made and owned. It features light, non-comedogenic products that combine ATP with active ingredients for fast and long-lasting results. It's ideal for those with oily skin, acne-prone skin and those concerned about ageing too. I tried out both of their cleansers 'Clean with Envy' (Non Active) and 'A Mean Clean' (Active, AHA-based cleaner, to see what the difference was between the two. Of course both products look to give of an effective cleanse, but it all comes down to what skin type you have. For example 'Clean with Envy' which is a non-active cleanser, is made for all skin types to use as it's super gentle and luxurious. It foams up really nicely and you can tell it works to lift away and dirt from underneath the skin. I would use this cleanser twice a day (AM and PM) to really ensure that I'm cleansing my skin thoroughly on a daily basis. It's not as potent as 'A Mean Clean', but it does the job in looking to give you a cleansed complexion. As for their 'A Mean Clean' it features an active AHA-foaming formula which instantly looks to lift dirt, grime and oil from the skin - giving you a glowing skin complexion. This product is made for those with skin concerns such as acne and ageing. As I am getting the occasional acne, this product is well suited for my skin as it leaves my complexion looking more radiant after cleansing. After 10-days of using both of these cleansers by Dermaenergy, I've noticed my skin to clear up gradually which is amazing. I do use their Dermabrush when cleansing my skin because I've found that it has helped to lift dirt/oil for more of a thorough cleanse. (So the trick is to cleanse using a cleansing brush or silicone brush). Overall, my complexion is looking more radiant and refreshed all thanks to the Dermaenergy range. 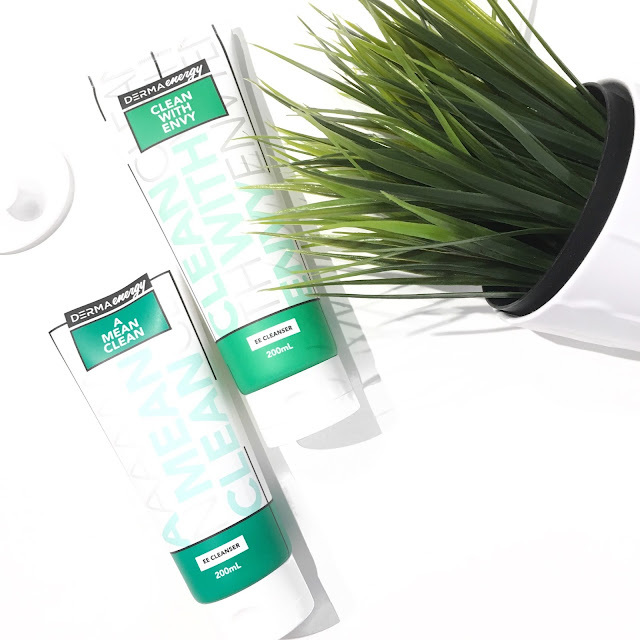 The products 'Clean with Envy' and 'A Mean Clean' can be purchased via their official website here. Have you tried out the cleansers as mentioned above?